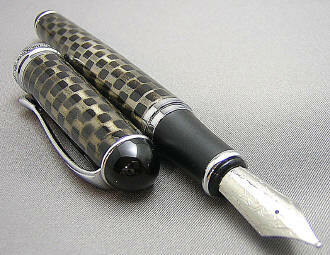 Let me first mention that this is an all-metal pen, and is not covered in snakeskin! 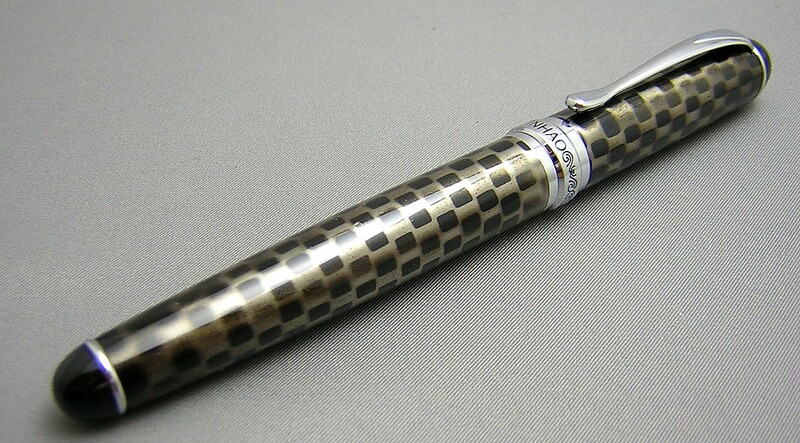 I suppose that this pen could also have been called the Chessboard or Checkerboard, but the somewhat diffuse, slightly irregular markings more readily suggest a biological pattern. 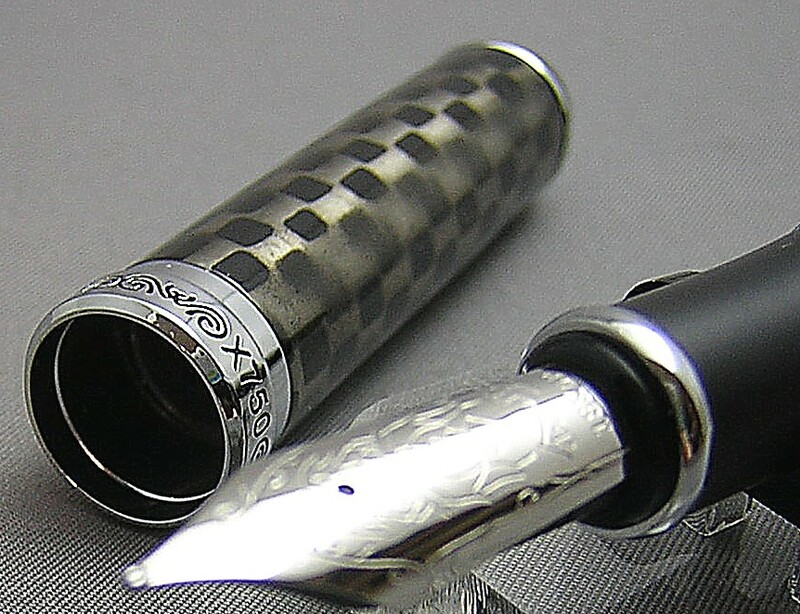 Although of metal construction, the pen is actually quite light, and writing for extended periods with the cap posted is not a fatiguing proposition at all. 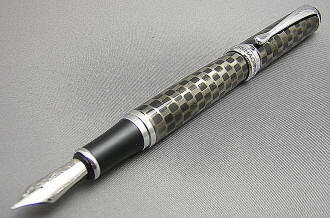 Due to the fairly dark colors, this is actually a demur-looking pen and quite sophisticated in appearance. 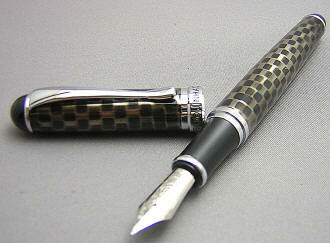 A visually arresting sheen appears under direct light, which almost makes the pattern seem lit-from-within. The clip has a graceful arc to it that's in keeping with the overall understated appearance. 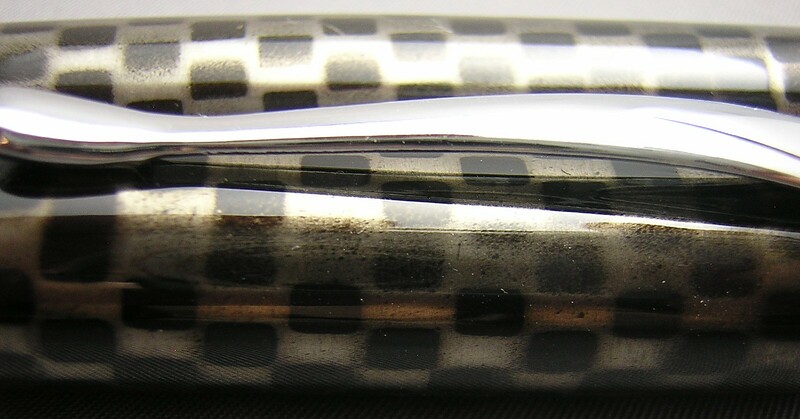 Removing the slip cap -- which securely reattaches with a satisfying snap -- reveals the oversized nib (larger than that on a Pelikan M800 for instance, but not quite as large as that one a Montblanc 149). 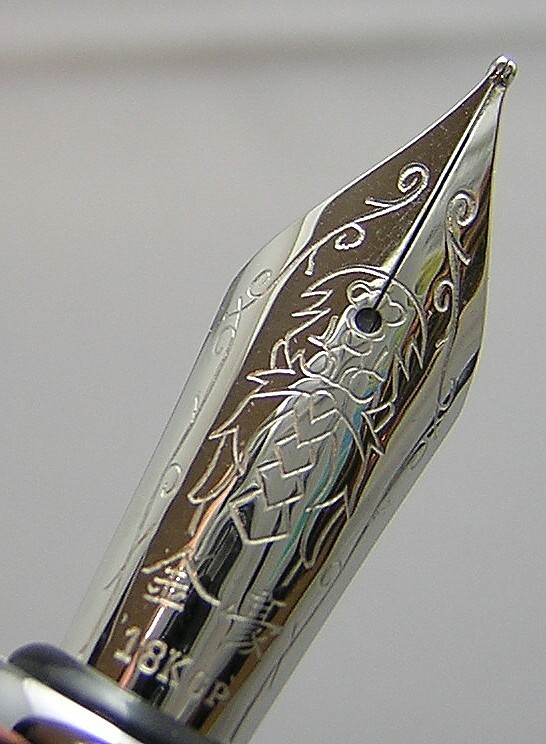 The nib is a monotone, 18K gold-plated steel nib. I personally find these nibs a joy to use, and rate them as western mediums. 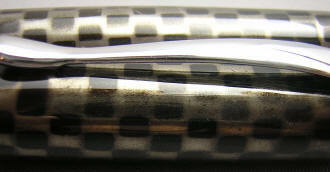 The nib pictured shows a dragon's head and neck, and is also engraved with the Chinese characters for Jin Hao and '18K GP'. Jinhao sometimes uses the regular nib, which is engraved with 'Jinhao' rather than the dragon's head. 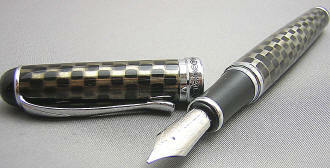 Unscrewing the barrel reveals the piston converter for bottled ink, with its included ink-agitator inside. It will also take International-style cartridges, such as those from Private Reserve. As with all new pens, I recommend to run a dilute solution of dishwashing soap (two or three drops to a small bowl of water) through a new pen a few times, followed by water only. Step one is effective at removing manufacturing oils that can tend to make the ink less than enthusiastic in heading from the converter/filler to the nib, and step two removes the traces of the detergent you've used...which tends to have the opposite, diuretic effect. A gift box is included.